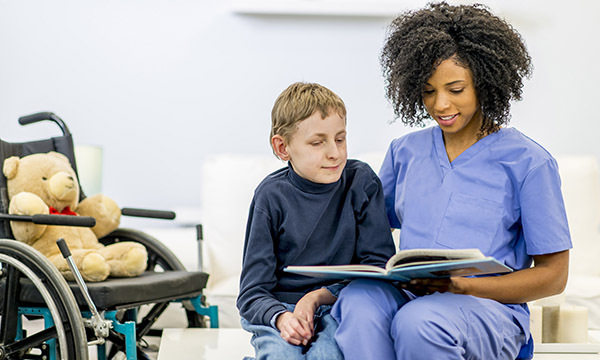 Throughout children's nurse training students are told how vital forming strong communication skills is to building a therapeutic relationship with a child or young person and their families. Non-verbal communication models, such as SOLER, are excellent in this regard. SOLER stands for ‘sit squarely, open posture, lean towards each other, eye contact, relax’. But how do you achieve these with a child or young person who can’t make eye contact or understand social communication cues? During training students are encouraged to adapt their styles of language for each individual and prompt conversation. But what if the child or young person cannot speak or understand spoken language, or uses other communication methods, such as the Picture Exchange Communication System or the sign language Makaton? Introducing play therapists has been a much-needed step forward in this context, but their introduction into hospitals can inhibit children’s nurses from learning adaptive skills of play, distraction and communication. At my university, a team of passionate third-year learning disability students are tackling these issues by forming the learning disability student champions training initiative. They have created a bespoke programme of training predominantly aimed at students who are not studying on the learning disability nursing field. They can help provide training in specific communication methods, including Makaton, behaviour and sensory awareness, and in making reasonable adjustments. All registered children’s nurses and children’s nursing students should have the skills to help patients with learning disabilities. By making appropriate training available to nurses we can ensure that the care people with learning disabilities receive is the same as that received by anyone else.